Just like your other furniture, cabinets need maintenance to keep them looking new. Mostly this means wiping down surfaces and dusting, but occasionally you might want to fix scratches and other blemishes. Dust your cabinets with a soft, dry cloth (avoid pre-packaged, pre-moistened sheets and aerosol sprays). 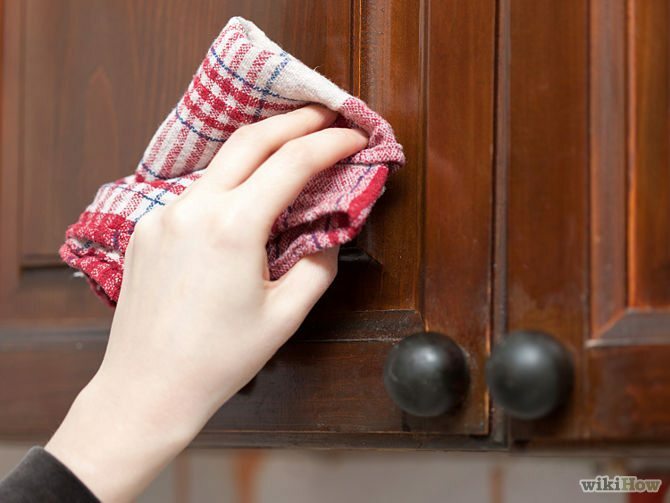 To clean your cabinets, use a soft cloth and a solution of mostly water and a small amount of dish soap. Afterwards, wipe down your cabinets with a damp cloth, and remove any remaining moisture with a soft, dry towel. Do not use sponges or rags that you use to clean the rest of your kitchen, as oils and particles from food and cleaning agents may be present that scratch or discolor the surface of your cabinets. Do not use: Scouring agents or abrasive pads, chemical solvents, mineral spirits, ammonia, bleach, waxes or polishes when caring for your cabinets. To clean glass inserts, spray your cleaning solution onto a cloth then wipe the glass, taking care not to get any cleaner on your cabinet’s finish. Do not spray cleaner directly onto the insert- the mixture can seep underneath and cause discoloration to your cabinets. Clean messes immediately, otherwise they can stain. The longer you wait to clean spills, the harder they will be to remove. Do not hang wet or damp towels to dry over cabinets and drawers- moisture will visibly damage the finish. Take caution when using cooking sprays in your kitchen, directing the nozzle away from your cabinets – oils can harm the finish and cause build-ups that are difficult to clean. Don’t allow children to hang on cabinet doors or use drawers as a footstool (adults can be guilty of this too). It’s not only dangerous, it’s bad for the hinges and can cause serious damage to your cabinets. If you replace or reface your cabinets, purchase a repair kit from the manufacturer that includes putty or a touch-up pen in a matching color for emergencies. If you install custom-built cabinetry, find out what finish was used and purchase extra for touch-ups. Minor scuffs and scratches can be repaired easily with these DIY kits, however larger, deeper scratches and dings may take some experience to repair properly. Avoid DIY repairs if you aren’t confident in your ability or if extensive repairs are necessary. Remember, it’s always a safe bet to call a professional- that’s what they’re there for!